This Oven-Roasted Tomato Orange Roughy recipe is about as simple as it gets for dinner! 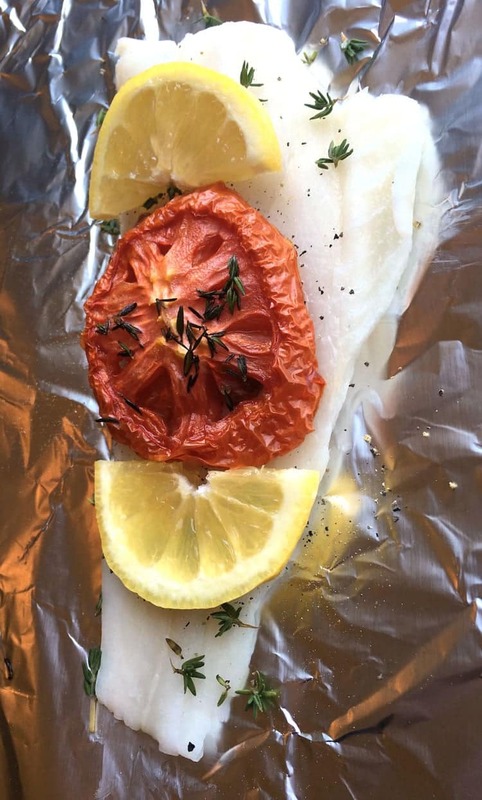 The quick and easy foil packet cooking method is the best way to cook orange roughy, and you’ll have dinner on the table in no time. I’ve mentioned before that we’re huge fans of the foil packet cooking method in my household. Foil packets are perfect to throw on the grill in the summertime when you want to sit outside and enjoy the nice weather, and they’re also perfect to use in the oven when it’s too cold outside to grill. Take a protein of your choosing and place it on a piece of aluminum foil. Add vegetables, seasoning, and herbs. Easy, versatile, and most definitely delicious! I promise it will quickly become one of your favorite cooking methods. Tip #1: You can swap orange roughy for any other fish or protein, but orange roughy is a great choice. Orange roughy is an especially nice fish to use because the orange roughy taste is quite mild and it doesn’t have a strong “fishy” taste. It also has a meaty and firm texture, so it doesn’t fall apart while cooking. If you want to substitute it for another fish, tilapia is a good choice. Tip #2: If you want to make this recipe on the grill, adjust the cook time. If you’re wondering how to make orange roughy on the grill, this recipe requires only a minor change. Instead of cooking the foil packets for 15 minutes, place the foil packets over direct heat (medium) and cook for 8-10 minutes. Tip #: No oven-roasted tomatoes? Make your own! It’s really easy to make your own oven-roasted tomatoes, and I’ve included the directions for how to do so in the section below. Tip #4: You can also make your own preserved lemons or buy preserved lemons online. Although this recipe allows for fresh lemons, you just can’t beat the intense lemony flavor of preserved lemons. You can make your own preserved lemons (use Himalayan salt blocks), or you can order preserved lemons here. One note about using preserved lemons: be careful adding salt to the recipe because the preserved lemons already contain salt. Taste the fish before you add any additional salt. Tip #5: Serve it with a steamed vegetable or cold pasta salad side. 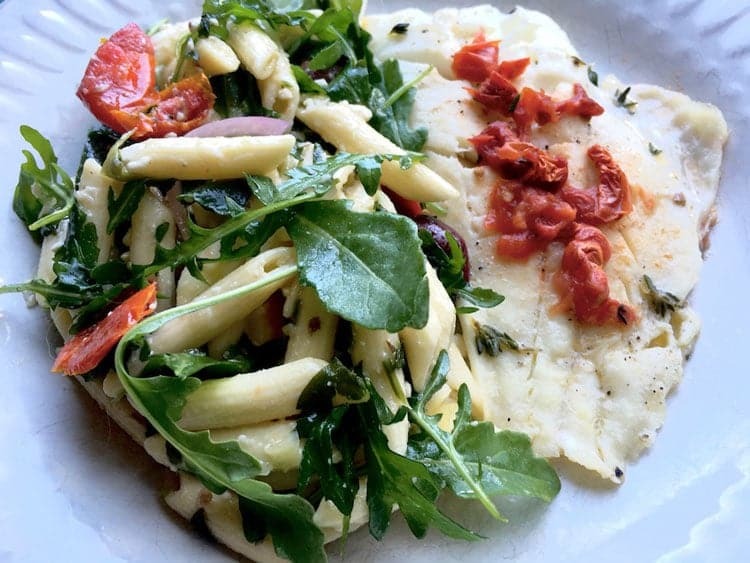 Oven-Roasted Tomato Orange Roughy is excellent with steamed vegetables (which you can also steam in a foil packet) or a cold pasta salad. Instead of buying oven-roasted tomatoes for this orange roughy recipe, why not make your own? I prefer this method over buying them because they come out so sweet, fresh, and full of flavor when you make them yourself. I find that buying oven-roasted tomatoes can be kind of hit-or-miss, but making them yourself always works! To make oven-roasted tomatoes, slice your tomatoes (as many as you’d like) into 2″ thick slices. Place them on a rimmed baking sheet that has been lined with parchment paper. Drizzle the slices with olive oil, and then sprinkle them with salt and pepper to taste. If you’d like, add fresh thyme leaves. Roast them in a pre-heated 200-degree oven for about 2 hours. Your finished oven-roasted tomatoes will be just slightly browned around the edges. Remove from the oven and use them immediately, or you can store them in an airtight container covered in olive oil. This container needs to be refrigerated and can be stored for 1-2 weeks. Hope You Enjoy This Orange Roughy Recipe! I hope you enjoy Oven-Roasted Tomato Orange Roughy. 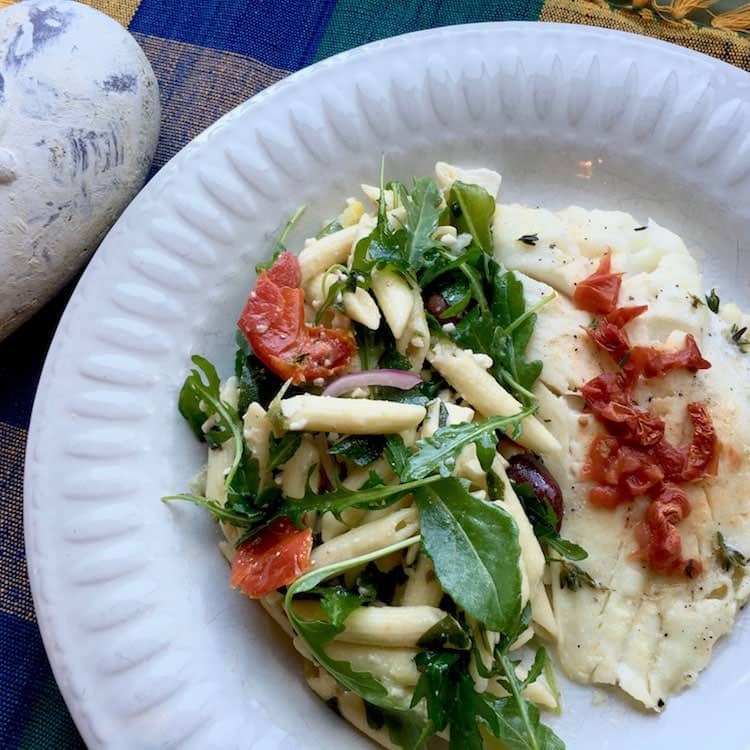 It really is one of the best orange roughy recipes I’ve tried! Another favorite of mine is Citrusy Baked Orange Roughy. It uses the foil packet cooking method just like this recipe, and it also calls for using preserved lemons if you can. I suggest making (or buying) a batch of preserved lemons and trying both of these recipes to see which one you prefer. (Or, if you’re like me, you’ll love them both.) Enjoy! This simple orange roughy recipe is easy to make in the oven or on the grill! Preheat oven to 400 degrees. Tear off 4 sheets of aluminum foil that are large enough to fold over an orange roughy filet and have a few inches to spare on each side to seal the packet. On each sheet, place a filet slightly off center and add 1 large oven-dried tomato slice and 2 lemon slice halves on top. Top each fillet with a quarter of the fresh thyme, and then top with 1 tablespoon butter. Sprinkle salt and pepper on top to taste. Seal the packet by folding the aluminum foil in half over the ingredients. Fold the three open sides one at a time and over several times to seal the foil packet completely. The packets should be tight enough to hold in steam, but still loose enough to allow room for the air to expand. Into the preheated oven, place the packets and cook for 15 minutes. (If using filets that are still frozen, add a couple minutes to your cooking time.) After cooking, open the foil packets carefully to avoid the hot steam. Discard lemon slices. You can either transfer the filets to plates or leave them inside of the foil packets. Serve with Mediterranean pasta salad, steamed vegetables, or another side dish with complementary flavors.